VStat was written several years ago prior to existence Windows 7 and Windows Vista and has not been updated since then. It may not offer full functionality on those newer versions of the operating system. VStat is a small GUI tool that produces similar output to the traditional command line tool netstat. 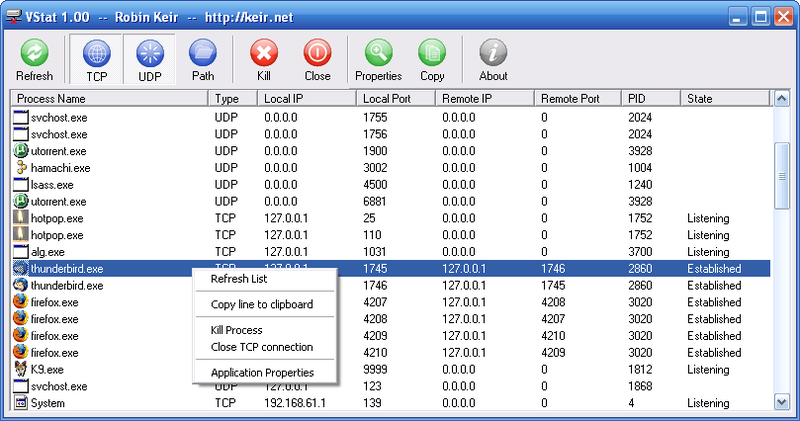 In addition to showing the various states of network activity on your computer it shows the associated application name and process ID. VStat allows you to close any existing established TCP connection and will give you the ability to terminate the owning application associated with any entry, provided you have the relevant permissions to do so. Please note that the ability to show the associated application name and process ID is only available on Windows 2000 with all current service packs and hot fixes installed and on Windows XP. When run on other Windows versions you will not see any information in the Process Name or PID columns.